Ring a ring o’roses is the original flower garland workshop founded in 2009. Made to measure, last forever. We are more than just a craft workshop, we offer a tailored experience. From the initial fitting, where you watch a length of willow being expertly twisted into your base ring which is then precisely fitted to your head, you walk into our unique workspace which is full to the rafters of flowers, beads, feathers, ribbons, bells and butterflies. Our staff will give a comprehensive interactive demonstration of the necessary techniques and use of the tools and equipment. You are then handed your own basket to gather flowers in and told you can use whatever you like to create your own bespoke headdress. Your basket will quickly fill up with treasure as you wander round rummaging in baskets, looking through bead boxes and pigeonholes. Experience a naughty thrill as you pick flowers from our front garden (even though you've been told you may!). 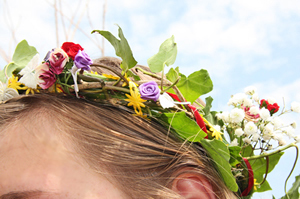 It takes anywhere between 30 minutes and 3 hours to make your headband, depending on how involved you become. But beware, it is addictive! You'll get a real buzz out of using the florists tape, wire and hot glue to make something so pretty. Our staff are always on hand to offer advice and assistance. When the garland is complete, you will experience a flood of admiration for yourself for creating an original piece of wearable art. And the best part? It's handmade by you. For outside events we supply and erect an attractive covered working area and provide furniture, signage and all necessary tools and equipment. For indoor events all we require is an area set up with tables and chairs, size dependant on the number of guests. We bring everything we need with us, and we can run on solar so setting up in the middle of a field is easy peasy. Our gorgeous Douglas Fir mortice & tennon Workshop Yurt has been purpose built and has a 8m x 8m footprint. It is an amazing space to work in; the half yurt at the rear gives it a cosy feel whatever the weather while the front is open and inviting. It needs to be erected at least the day before. We are based in Snowdonia National Park and work UK wide.